Motto Sparkling Matcha Tea Giveaway! A few months ago at a cross fit blogger event, I came across this unique new drink, called Motto. Bottled up like beer, but alcohol free of course, I was immediately intrigued. I’ve been a big tea drinker for years ( hello I’m a frequent Steeper at David’s Tea), but of course my relationship with tea comes and goes with the seasons, with me and tea sharing a closer bond in the colder months. Which is unfortunate, because tea is so good for you! Studies have even found that some teas may help reduce cancer and heart disease risk. Tea also appears to have antimicrobial qualities. When it comes to matcha tea, Motto is the world’s first bottled matcha green tea beverage delivering the health benefits of this centuries’ old elixir in a ready-made proprietary formula. Motto is handcrafted in small batches, containing premium matcha: stone-ground green tea leaves, sourced from Japan. One bottle of Motto delivers the health benefits of 12 cups of steeped green tea with one-third the caffeine of a single cup of coffee. Apparently when you drink matcha you ingest the whole leaf, not just the brewed water but usually you might find matcha served steeped not with the whole leaf. However, Motto sources their matcha from Japan and ensures that the whole leaf is present! Motto match tea also contains antioxidants. One of biggest the buzz words in nutrition, antioxidants are naturally occurring chemical compounds that help prevent chronic disease. Fruits and vegetables naturally contain antioxidants, but according to some studies, matcha contains the antioxidant EGCG, which is believed to be a powerful anti-carcinogen. 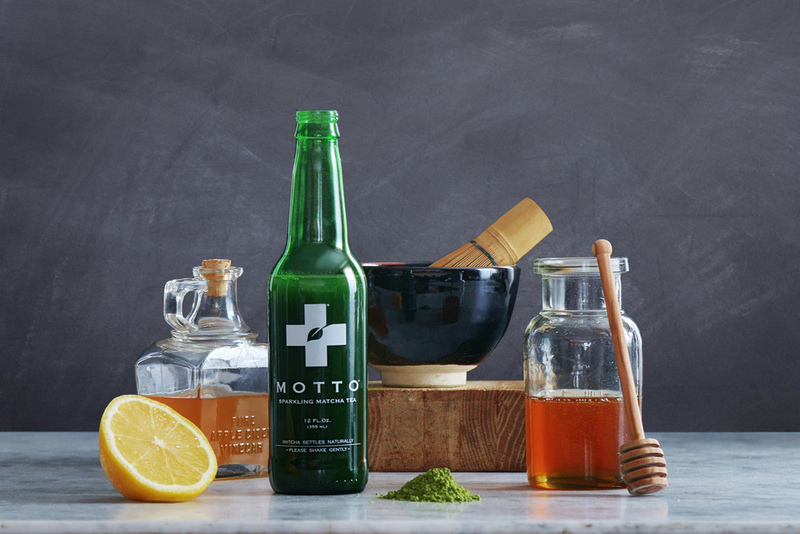 In Motto you will find: Matcha Green Tea, Organic Apple Cider Vinegar, Honey, Organic Agave, Fresh Lemon Juice, Sparkling Water and Natural Plant Extracts. As a result you WILL find a high sugar content because honey and agave are sugar- 14 grams! (whoa!) and the daily allotment for females is no more than 20 grams of added sugar. With that being said consume in moderation or as a sweet treat. I like to drink half one day and half the other so as not to consume more than half my day’s allotment on one product. So, just be mindful! Chlorophyll: Matcha is grown in the shade, which is why it is richer in chlorophyll than other green teas. Chlorophyll is a powerful compound that cleans red blood cells and creates new ones, helping the body detox and stay strong to fight inflections. Catechins: Highly concentrated in green tea, Catechins are super antioxidants that are 25 times as potent as Vitamin C and 100 times as potent as Vitamin E. Catechins protect our cells from oxative damage and fight free radicals. Beta-carotene: Beta-carotene is a powerful immune booster and promotes skin and eye health. Motto is currently sold in over 400 retailers in 28 states—everywhere from Whole Foods Market to gourmet delis and small, locally-owned, natural grocers. It originally began being sold in a natural and organic cafe in Nantucket and is now sold in Boston here. Because I love Motto so much I am hosting a giveaway to one lucky reader who will win a case of Motto! To enter, simply enter/click the rafflecopter below. Raffle Ends July 6th! Open to U.S. residents only in the GREATER BOSTON AREA!